Welcome to the fifth edition of Linnaeus' Legacy, the monthly taxonomy and biodiversity carnival. Yes, it's now been five months since I started this event, and I've been really happy with the response it's gotten so far. Thank you so much to everyone who's played a part in making it happen, and let's keep making it happen for as long as there's an interweb for it to happen on! In that congratulatory air, I'm going to prefix this carnival with... a link to another carnival! Carnival of the Blue, which covers all things oceanic, has been up at Switchboard for a couple of days, so I'll take the opportunity to bring your attention to it. We are, unfortunately, in the midst of a Great Taxonomy Crisis. The number of workers in taxonomy has been steadily declining, and a significant proportion of those workers still active are approaching or even past retirement age. This is a Crisis (with a capital C) in the making because taxonomy is one of the lynchpins of all other biological research - you can't do any sort of productive communication about your studies on an organism if you don't know what to call it. How are we going to revitalise the study of taxonomy? Kevin Z thinks Open Access publishing might be the way to go. Others think that a change in the way we do taxonomy is called for, but that immediately inspires the question of how did we do taxonomy before? John Wilkins examines one of the oft-repeated stories about what inspired Linnaeus' taxonomic work, and wonders if the story has any merit. The Encyclopedia of Life is a website that may increase the perception of taxonomy through its aim to have an information page available for ecery species on the planet. Rod Page took a look at it, and feels it has some way to go yet. Yours truly got quite excited over the description of Chromera, a seemingly featureless blob of a unicellular alga that actually goes some way to answering some very significant questions - as well, of course, as bringing up a whole bunch of new ones. Taxonomy also has an essential role to play in the Biodiversity Crisis, as increasing numbers of species become endangered or extinct due to human activities. We need to know what's there before we can hope to protect it! Jamie McIntosh tells us about a recent project to insure some of the world's plant biodiversity by starting a global seed bank on icy Svalbard, not far south of the North Pole. Meanwhile, Podblack Cat describes her astonishment at discovering that cauliflowers, kale, cabbages and kohl rabi were all different forms of the one species - the protean Brassica oleracea! After waxing poetical about the potential of a Brassica bouquet, though, she still has some preference for the more traditional roses she had just received. Bob Crean has started an online guide to all matters scorpion, with a series of detailed explanations of scorpion descriptive terms. If you don't know how to tell your prosoma from opisthosoma, this is the place to find out (before you get into serious trouble). Sam Heads has some steamy photos for us of some very stick-insect-like grasshoppers caught in flagrante. Not that they were probably that difficult to catch - some insects can remain attached to each other for days! 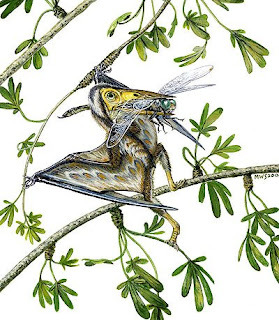 Among the discoveries published in the last month was one of the smallest pterosaurs yet known. Mike Keesey has more, in a post aptly named "Adorable Science". GrrlScientist, meanwhile, turns her attention to the question of when birds first appeared on the scene. Everyone knows the value of a lemur for getting people's attention - just ask John Cleese. Greg Laden has a post on a recent study that aims to resolve the phylogeny of the lemur families. Afarensis wrote more on the same. Funnily enough, no-one mentioned Bugtilemur - maybe they're hoping it'll go away and quit sticking it's rhinarium where it's not wanted. Regrettably, the aetosaur issue reported on in the last edition still continues to haunt us. Mike Taylor has links to the available coverage, and there have been recent posts from Julia Heathcote, Paul Anderson, The ReptiPage, ReBecca Hunt, Mike Keesey, Chris Rowan, Brian Switek and Janet Stemwedel. Thank you for reading this month's Linnaeus' Legacy. April's instalment will be coming courtesy of From Archaea to Zeaxanthol. After that, we're still looking for hosts. If you would like to host an instalment of one of the net's best blog carnivals, let me know! If you don't, I'm going to start calling in favours from people, and they're going to feel like real heels if they have to say no. So for their sake, volunteer! Linnaeus' Legacy wants YOU! Image Credits: Primate phylogenetic "tree" from Chinh Hoang. 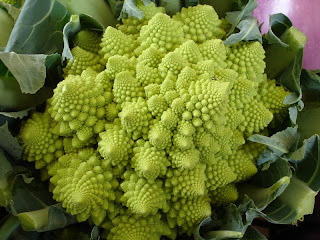 Cathedral cauliflower from Botany Photo of the Day. 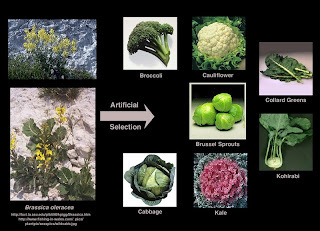 Brassica oleracea variation slide from Dr. Bruce Railsback. 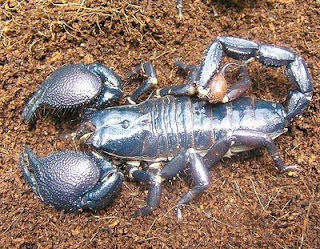 Emperor scorpion from Ugly Overload. Nemicolopterus reconstruction from Scientific American. You're quite right... it was extremely easy to catch the proscopiids "at it". Male proscopiids are well known for their mate guarding behaviour and often remain mounted on the female for days on end, ready to fight off any competing males.